First of all, here's what's on the immediate racing calender. Today is the Clásica de Almería (1.1) takng place in southern Spain. On Tuesday, the 17th, the Tour of Oman (HC)begins. Then on Wednesday, the 19th we've got the start of two important Iberian stage races. In Portugal there is the Volta ao Algarve and in Spain the Volta a Andalucia Ruta Ciclista del Sol will begin. Then, to make sure we're all getting enough bicycle competition, on the 19th there will be the big-deal Italian race, the Trofeo Laigueglia (HC). BikeRaceInfo will cover them all. 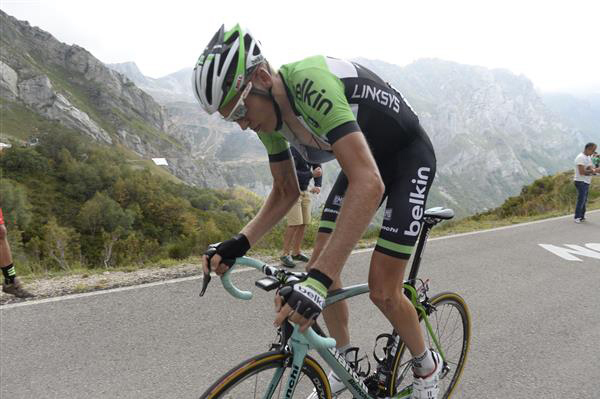 The 2014 Vuelta a Espana winner will not defend his title this year. 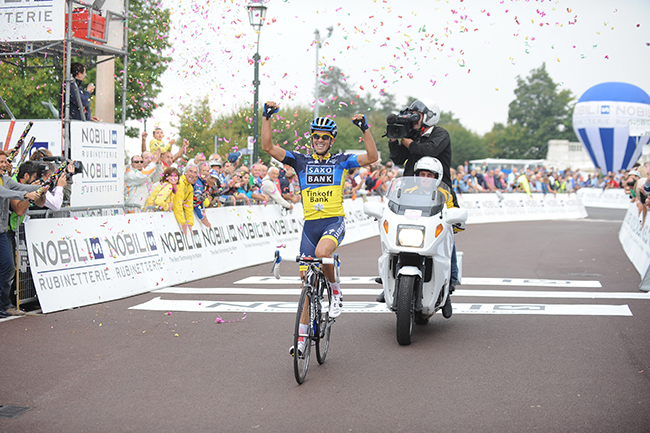 Instead, Alberto Contador has announced his intention to win both the Giro d'Italia and the Tour de France in 2015. No rider has ever won all three Grand Tours in the same year. Tour of Oman [17 – 22 Feb]: Philip Deignan, Nathan Earle, Christian Knees, Leopold König, David Lopez, Danny Pate, Wout Poels, Chris Sutton. Ruta del Sol [18-22 Feb]: Chris Froome, Peter Kennaugh, Vasil Kiryienka, Mikel Nieve, Nicolas Roche, Kanstantsin Siutsou, Xabier Zandio. Volta a Algarve [18-22 Feb]: Ian Boswell, Andy Fenn, Sebastian Henao, Lars Petter Nordhaug, Richie Porte, Salvatore Puccio, Ben Swift, Geraint Thomas. will not put its riders under pressure to perform. Sports Director Nico Verhoeven wants his team in Portugal to work towards bigger races later in the season. "We will try to win a stage,” said Verhoeven, “but the important thing is that we start the season well.” He has already set his sights on the season’s first big races. The Belgian opening weekend, Omloop Het Nieuwsblad and Kuurne-Brussels-Kuurne, marks the beginning of a series of important races. “Our classic riders need to build rhythm ahead of those races. Tom Van Asbroeck, Paul Martens and Robert Wagner are fast. They’re allowed to get in the mix in the sprints in the Algarve. Robert Gesink enjoys a gentle slope. Team line-up: Tom Van Asbroeck, Robert Gesink, Paul Martens, Bram Tankink, Sep Vanmarcke, Robert Wagner, Kevin De Weert and Maarten Wynants. This year’s edition of Tour of Qatar was sealed today in Doha and the overall classification was equally decided. Tinkoff-Saxo’s Maciej Bodnar finished 2nd in the general classification just six seconds behind race winner Niki Terpstra. The final stage was concluded in a final sprinter’s duel, where Peter Sagan finished 4th behind stage winner Sam Bennett. Sagan could also claim his first jersey for Tinkoff-Saxo, as he finished atop the young rider classification. With Tour of Qatar 2015 finished, Tinkoff-Saxo's Sport Director Tristan Hoffman takes stock and assesses the last six days of tough, windy and dramatic racing. The 124.5km stage to Doha Corniche with finish along the waterfront turned into a classic sprinter’s duel. The small breakaway of the day was picked up well before the finale and the fast guys lined up behind their teammates for the lead-out. Tinkoff-Saxo took to the front on the last 1.5km, where Matti Breschel delivered Peter Sagan in a good position at the 200-meter marker. But Sam Bennett (Bora-Argon 18) timed his sprint well in the wind-exposed conditions and took the stage win on the last 50 meters. After his first race in the Tinkoff-Saxo jersey, Sagan stated that he was happy with the overall result of the race. “It was my first race for my team Tinkoff-Saxo and I’m very happy with how the race went – except for my crash on stage 1 of course. I think it’s a good start to the season for me and also for the team in general. We are all very happy for the result Bodnar achieved”, evaluates Peter Sagan, who finished 2nd twice, 4th twice and won the white jersey. “Actually I’m convinced that we could have won the GC with Bodnar. It was our fault that we didn’t put the hammer down in the final kilometers of stage 5. But we have many important races to come, so I see this is a good start with some promising signs”. Maciej Bodnar’s 2nd place was the best GC result of the strong Pole’s career and he takes the time to show his appreciation. “It was absolutely a positive week. We didn’t take the win, but we showed that we’re a strong team. I would like to thank the rest of the squad for their job and effort, as they have worked really hard and consistently for six days. We could perhaps have done something different yesterday, but we didn’t do it in the split second, where the opportunity was there. That’s how it is, but I’m pretty confident that we will have the opportunity to take the win in important races during the season", says Maciej Bodnar with a smile.